Amazing value for money, this laptop delivers in many levels. Although corporate users can't buy a new IBM ThinkPad at this price range, Lenovo, the company behind these machines, also makes a budget laptop. The 3000 C100 (£387 inc. VAT) is affordable, yet boasts many of the ThinkPad's virtues. Most impressive is the build quality, which is only bettered by the HP Compaq. The keyboard uses the same patented design as found on the ThinkPad, meaning you'll find large, firmly attached keys that are damped and move quietly. It's also a comfortable machine to use, thanks to a large, flat palm rest. The plastic used throughout the chassis is robust and, with a thick and resilient screen, the C100 is more than up to the strains of day-to-day use. A weight of 2.9kg makes this a semi- portable machine. The display is a 15-inch standard TFT panel with a 4:3 aspect ratio. While this has long been the preferred choice for business users, many are now switching to widescreen formats for the extra space. Because it doesn't have a glossy Super-TFT coating, you'll find it's not prone to reflections. Images are bright, but lack sharpness, due to the average XGA resolution of 1024 x 768 pixels. Graphics come courtesy of Intel's 915GM integrated GPU. Although recently superseded by the Intel 945GM chipset, performance is adequate for everyday tasks. Costs have been kept down by way of the low specification. Intel's 1.5GHz Celeron M 370 - a budget solution - provides processing power. It's backed by 512MB of DDR2 memory, and a 40GB hard drive. Although the C100 achieved a low score (188 points) in our MobileMark 2005 benchmark, it's still a capable machine, and will run basic applications without trouble. Where it really impresses is battery life - lasting 371 minutes, under test conditions, from a single charge. Although compromises have been made over the choice of processor, you'll find everything you need for working on the go. Wireless networks can be configured thanks to an 802.11b/g adapter, and a 10/100 Ethernet card allows connection to fixed networks. A front-loading CD rewriter enables the back-up of files, and will also play DVDs. Connectivity is also good: S-Video and VGA-out sockets enable connection to external monitors and projectors. 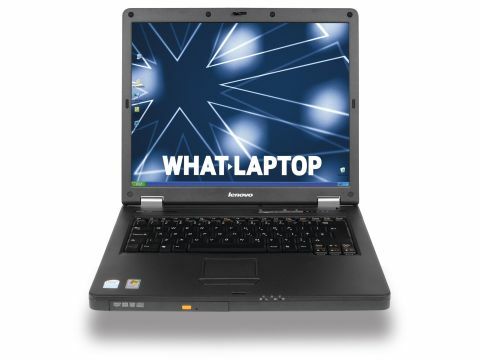 The Lenovo 3000 C100 has a large battery life that more expensive machines struggle to match. The impressive build quality should also make this machine worthy of your consideration, and for those on a tight budget the C100 is unbeatable.